For other uses, see Vaasa (disambiguation). Vaasa (Finnish pronunciation: [ˈʋɑːsɑ]; Swedish: Vasa, IPA: [ˈvɑːsɑ]) is a city on the west coast of Finland. It received its charter in 1606, during the reign of Charles IX of Sweden and is named after the Royal House of Vasa. 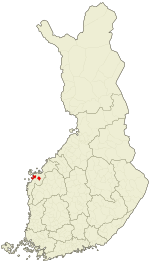 Vaasa has a population of 67,588 (31 January 2019) (approximately 120,000 in the Vaasa sub-region), and is the regional capital of Ostrobothnia (Swedish: Österbotten, Finnish: Pohjanmaa). The city is bilingual with 69.8% of the population speaking Finnish as their first language and 24.8% speaking Swedish. The surrounding Ostrobothnian municipalities have a clear Swedish-speaking majority, which is why the Swedish language maintains a strong position in the city. Over the years, Vaasa has changed its name several times, due to alternative spellings, political decisions and language condition changes. At first it was called Mustasaari or Mussor after the village where it was founded in 1606, but just a few years later the name was changed to Wasa to honor the royal Swedish lineage. Mustasaari (Finnish) or Korsholm (Swedish) remains as the name of the surrounding mostly rural municipality, which since 1973 surrounds the city. The city was known as Wasa between 1606 and 1855, Nikolaistad (Swedish) and Nikolainkaupunki (Finnish) between 1855 and 1917, Vasa (Swedish) and Vaasa (Finnish) after the February revolution, with the Finnish spelling of the name being the primary one from ca 1930 when Finnish speakers became the majority in the city. The history of Korsholm (Finnish: Mustasaari) and also of Vaasa begins in the 14th century, when seafarers from the coastal region in central Sweden disembarked at the present Old Vaasa, and the wasteland owners from Southwest Finland came to guard their land. 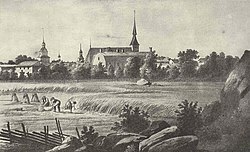 In the middle of the century, Saint Mary's Church was built, and in the 1370s the building of the fortress at Korsholm, Crysseborgh, was undertaken, and served as an administrative centre of the Vasa County. King Charles IX of Sweden founded the town of Mustasaari/Mussor on October 2, 1606, around the oldest harbour and trade point around the Korsholm church approximately seven kilometres (4.3 miles) to the southeast from the present city. In 1611, the town was chartered and renamed after the Royal House of Vasa. Thanks to the sea connections, ship building and trade, especially tar trade, Vaasa flourished in the 17th century and most of the inhabitants earned their living from it. In 1683, the three-subject or Trivial school moved from Nykarleby (Finnish: Uusikaarlepyy) to Vaasa, and four years later a new schoolhouse was built in Vaasa. 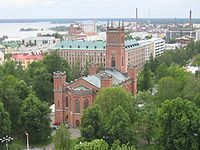 The first library in Finland was founded in Vaasa in 1794. In 1793, Vaasa had 2,178 inhabitants, and in the year of the catastrophic town fire of 1852 the number had risen to 3,200. During the Finnish War, fought between Sweden and Russia in 1808–1809, Vaasa suffered more than any other city. In June 1808, Vaasa was occupied by the Russian forces, and some of the local officials pledged allegiance to the occupying force. On 25 June 1808 the Swedish colonel Johan Bergenstråhle was sent with 1,500 troops and four cannons to free Vaasa from the 1,700 Russian troops who were led by generalmajor Nikolay Demidov. The Battle of Vaasa started with the Swedish force disembarking north of Vaasa in Österhankmo and advancing all the way to the city where they attacked with 1,100 troops, as some had to be left behind to secure the flank. There was heavy fighting in the streets and in the end the Swedish forces were repelled and forced to retreat back the way they came. Generalmajor Demidov suspected that the inhabitants of Vaasa had taken to arms and helped the Swedish forces, even though the provincial governor had confiscated all weapons that spring, and he took revenge by letting his men plunder the city for several days. During those days 17 civilians were killed, property was looted and destroyed, many were assaulted and several people were taken to the village of Salmi in Kuortane where they had to endure the physical punishment called running the gauntlet. The massacre in Vaasa was exceptional during the Finnish war as the Russian forces had avoided that kind of cruelty that far. It was probably a result of the frustration the Russians felt because of intensive guerilla activity against them in the region. On 30 June the Russian forces withdrew from Vaasa, and all officials that had pledged allegiance to Russia were discharged, and some were assaulted by locals. On 13 September the Russian forces returned and on the next day the decisive Battle of Oravais, which was won by Russia, was fought some 50 kilometres (30 mi) further north. By winter 1808, the Russian forces had overrun all of Finland, and in the Treaty of Fredrikshamn (17 September 1809) Sweden lost the whole eastern part of its realm. Vaasa would now become a part of the newly formed Grand Duchy of Finland within the Russian Empire. The mainly wooden and densely built town was almost utterly destroyed in 1852. A fire started in a barn belonging to district court judge J. F. Aurén on the morning of August 3. At noon the whole town was ablaze and the fire lasted for many hours. By evening, most of the town had burned to the ground. Out of 379 buildings only 24 privately owned buildings had survived, among them the Falander–Wasastjerna patrician house (built in 1780–1781) which now houses the Old Vaasa Museum. 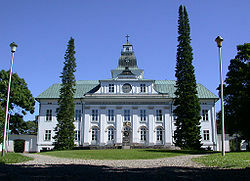 The Court of Appeal (built in 1775, nowadays the Church of Korsholm), some Russian guard-houses along with a gunpowder storage and the buildings of the Vaasa provincial hospital (nowadays a psychiatric hospital) also survived the blaze. The ruins of the greystone church, the belfry, the town hall and the trivial school can still be found in their original places. Much of the archived material concerning Vaasa and its inhabitants was destroyed in the fire. According to popular belief, the fire got started when a careless visitor fell asleep in Aurén's barn and dropped his pipe in the dry hay. The new town of Nikolaistad (Finnish: Nikolainkaupunki), named after the late Tsar Nicholas I, rose in 1862 about seven kilometres (4.3 miles) to the northwest from the old town. The town's coastal location offered good conditions for seafaring. The town plan was planned by Carl Axel Setterberg in the Empire style. In the master plan the disastrous consequences of the fire were considered. Main streets in the new town were five broad avenues which divided the town into sections. Each block was divided by alleys. The town was promptly renamed Vasa (Vaasa) after the Tsar Nicholas II was overthrown in 1917. During the Finnish Civil War, Vaasa was the capital of Finland from 29 January to 3 May 1918. As a consequence of the occupation of central places and arresting of politicians in Helsinki the Senate decided to move the senators to Vaasa, where the White Guards that supported the Senate had a strong position and the contacts to the west were good. The Senate of Finland began its work in Vaasa on 1 February 1918, and it had four members. The Senate held its sessions in the Town Hall. To express its gratitude to the town the senate gave Vaasa the right to add the cross of freedom, independent Finland's oldest mark of honour designed by Akseli Gallen-Kallela, to its coat of arms. The coat of arms is unusual not only in this respect, but also because of its non-standard shape and that decorations and a crown are included. Because of its role in the civil war, Vaasa became known as "The White City". A Statue of Freedom, depicting a victorious White soldier, was erected in the town square. The language conditions in the city shifted in the 1930s, and the majority became Finnish-speaking. Therefore, the primary name also changed from "Vasa" to "Vaasa", according to Finnish spelling. Post-war, Vaasa was industrialized, led by the electronics manufacturer Strömberg, later merged into ABB. In 2013 the municipality of Vähäkyrö was merged into Vaasa. It is currently an exclave area of the city, since it is surrounded by other municipalities. Near the Polar Circle, Vaasa falls in continental subarctic climate (Köppen: Dfc) with severe dry winters and almost warm winters. The prevailing direction of the winds, North Atlantic Current and the proximity of the Gulf of Bothnia gives a climate a certainly livable in the city altought despite the latitude, similar to the south of Alaska, where continentality, proximity to the poles and moderation intersect. The Föhn wind, for example, passes over the Scandinavian Mountains and leaves a milder and drier weather in the lee of the mountains where Vaasa is found, affecting especially in the winter which explains sunny days even in the season of curt solar duration. The location of some sea distance gives a seasonal delay of spring and summer at the same time that autumn and winter are affected late. The average annual temperature is only 4.2 °C (normal from 1981-2010). The low Ostrobothnia usually receives little snow but the contact of cold air with warmer and humid air can generate heavy snowfall. Early summer (as well as spring) tends to be drier and the wettest month does not coincide with the warmer month. End of April is usually the growing season with 250-300 mm approximately. The maritime breeze explains the difference in temperature, distribution of precipitation and sunshine, different from the Gulf of Finland, the Gulf of Bothnia brings the sea wind in places further distant about 50 km from the coast. The city gets more sun than inland places, although current log are unavailable. Vaasa has three universities. 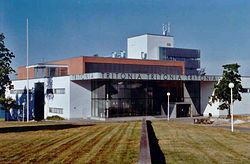 The largest one is the University of Vaasa, which is located in the neighbourhood of Palosaari. Palosaari is a peninsula near the center of Vaasa, connected to it by bridges. The other two universities are Åbo Akademi, headquartered in Turku, and the Hanken School of Economics headquartered in Helsinki. Unique to Vaasa is the Finland-Swedish teachers training school Vasa övningsskola, part of Åbo Akademi. The University of Helsinki also has a small unit, specialized in law studies, in the city centre. The city has two universities of applied sciences: Vaasa University of Applied Sciences (former Vaasa Polytechnic), located right next to the University of Vaasa, and Novia University of Applied Sciences (former Swedish University of Applied Sciences). Vaasa is generally speaking an industrial town, with several industrial parks. Industry comprises one-fourth of jobs. There is a university (University of Vaasa), faculties of Åbo Akademi and Hanken, and two universities of applied sciences in the town. Many workers commute from Korsholm (Mustasaari), Laihia, and other municipalities nearby. The film production company Future Film has its head office in Vaasa. Kotipizza has its head office in the Vaskiluodon Satamaterminaali. Viljo Revell – Architect, works included Toronto City Hall in Canada. Mathilda Wrede – "Friend of the inmates"
Miika Koivisto – ice hockey player. Korsholm castle as a detail on a map made after 1752. The picture might depict a drawing from the 17th century, but is unreliable as a source. The detailed portal might have some equivalence with reality. ^ "Vaasa, Finland Köppen Climate Classification (Weatherbase)". Weatherbase. Retrieved 2019-03-03. ^ Ilmasto-opas.fi. "Suomen muuttuva ilmasto - Ilmasto-opas.fi". Ilmasto-opas (in Finnish). Retrieved 2019-03-03. ^ "Merituuli ja maatuuli - Ilmatieteen laitos". ilmatieteenlaitos.fi. Retrieved 2019-03-03. ^ "Kesätilastot - Ilmatieteen laitos". ilmatieteenlaitos.fi. Retrieved 2019-03-03. ^ "City (02911) - WMO Weather Station". NOAA. Retrieved March 3, 2019. ^ "Etusivu." Future Film. Retrieved on 19 January 2011. "Future Film Oy - Hovrättsesplanaden 9, 65100 VAASA - FIN"
^ "Contact Information Archived 2011-07-20 at the Wayback Machine." Future Film. Retrieved on 19 January 2011. "Office Oy Future Film Ab Hovioikeudenpuistikko 9 65100 VAASA FINLAND"
^ "Yhteystiedot & Palaute." Kotipizza. Retrieved on 11 October 2011. "Käyntiosoite: Vaskiluodon Satamaterminaali II kerros, 65170 Vaasa"
Wikimedia Commons has media related to Vaasa. Wikivoyage has a travel guide for Vaasa.